Remove any cartilage from the pork belly using a very sharp, small knife. Score the rind through to the flesh in a criss-cross pattern. Cut the leek into big chunks and wash thoroughly. Stud the onion with the cloves and tie the parsley, thyme and bay leaf together into a bouquet garni. Put the pork in a large saucepan with the leek, onion, bouquet garni and sea salt. Cover it by about 10cm water and cook at a bare simmer for 1 hour 45 minutes. Carefully take out the pork and reserve the stock. If the pork has been rolled and tied, untie it at this point. Lay it rind-side up on kitchen paper in a roasting tin for 15 minutes, to dry out a bit. Preheat the oven to 160C/gas 3. In a bowl, combine the soy sauce, honey, garlic, and pepper. Remove the kitchen paper from the tin then coat the pork rind with the marinade, pouring the rest into the bottom of the tin. Trim the leafy tops of the carrots to about 3cm. With the back of a heavy knife, stretch out the bacon rashers, then roll the carrots in them. Place them around the pork. 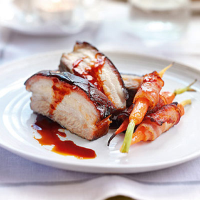 Bake for 40–45 minutes, basting the belly regularly with the juices, until the carrots are tender and the top of the pork is sticky and dark. it is very good in lentil soups.